Type Beretta There are 21 products. Pistol stock for shotgun type Beretta model 300 ga 12 – 20. Varnished and including recoil pad in bakelite. Made in Walnut wood dried 16%. Hole mm 270. The stock is straight and the verticle drop at heel is made by the metal plate. The stock is available with a left or right curvature of 3,5 mm. 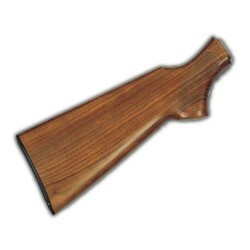 English style stock for shotgun type Beretta model 300 ga 12 – 20. Varnished and including recoil pad in bakelite. Made in Walnut wood dried 16%. Hole mm 270. The stock is straight and the verticle drop at heel is made by the metal plate. The stock is available with a left or right curvature of 3,5 mm. 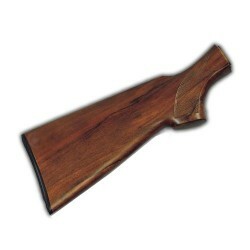 Pistol stock for shotgun type Beretta model 304 in ga 12, varnished and including recoil pad in bakelite. Made in Walnut wood dried 16%. Hole mm 223. The stock is straight and the verticle drop at heel is made by the metal plate. The deflection of stock is adjusted by anterior plate. Pistol stock for shotgun type Beretta model 390 in ga 12, varnished and including recoil pad in bakelite. Made in Walnut wood dried 16%. Hole mm 223. The stock is straight and the verticle drop at heel is made by the metal plate. The deflection of stock is adjusted by anterior plate. Pistol stock for shotgun type Beretta model 391 URIKA in ga 12, varnished and including recoil pad in bakelite. Made in Walnut wood dried 16%. Hole mm 223. The stock is straight and the verticle drop at heel is made by the metal plate. The deflection of stock is adjusted by anterior plate. Pistol stock for shotgun type Beretta model 301 in ga 12-20, varnished and including recoil pad in bakelite. Made in Walnut wood dried 16%. Hole mm 270. The stock is straight and the verticle drop at heel is made by the metal plate. The stock is available with a left or right curvature of 3,5 mm. Pistol stock for shotgun type Beretta model 302 in ga 12-20, varnished and including recoil pad in bakelite. Made in Walnut wood dried 16%. Hole mm 270. The stock is straight and the verticle drop at heel is made by the metal plate. The stock is available with a left or right curvature of 3,5 mm. Pistol stock for shotgun type Beretta model 303 ga 12 – 20. Varnished and including recoil pad in bakelite. Made in Walnut wood dried 16%. Hole mm 270. The stock is straight and the verticle drop at heel is made by the metal plate. The stock is available with a left or right curvature of 3,5 mm. 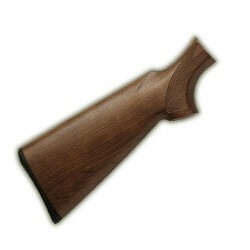 English style stock for shotgun type Beretta model 301 ga 12 – 20. Varnished and including recoil pad in bakelite. Made in Walnut wood dried 16%. Hole mm 270. The stock is straight and the verticle drop at heel is made by the metal plate. The stock is available with a left or right curvature of 3,5 mm. 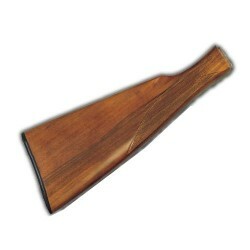 English style stock for shotgun type Beretta model 302 ga 12 – 20. Varnished and including recoil pad in bakelite. Made in Walnut wood dried 16%. Hole mm 270. The stock is straight and the verticle drop at heel is made by the metal plate. The stock is available with a left or right curvature of 3,5 mm. 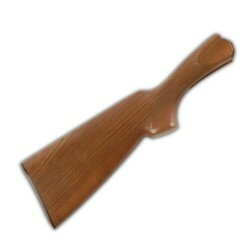 English style stock for shotgun type Beretta model 303 ga 12 – 20. Varnished and including recoil pad in bakelite. Made in Walnut wood dried 16%. Hole mm 270. The stock is straight and the verticle drop at heel is made by the metal plate. The stock is available with a left or right curvature of 3,5 mm.